This is lovely! Your watercoloring with those markers is terrific…….love the cluster of flowers! And thanks for the great sketch too! 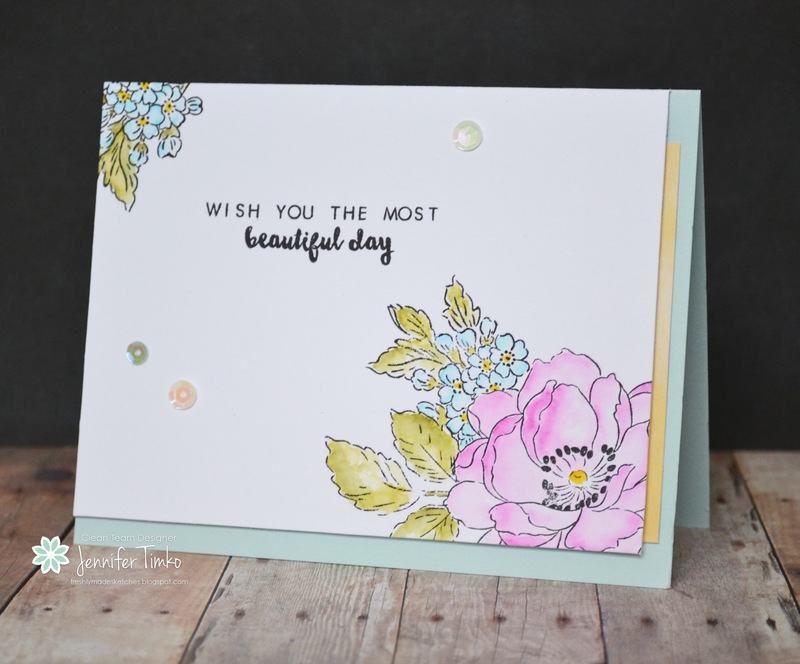 Beautiful card, fabulous coloring and a wonderful sketch! You are making me want to dig out those Zigs and get coloring! This is absolutely stunning! The flowers in both corners is a great look and the simple black sentiment is perfect! I’m so glad you’re doing this coloring challenge — we get the benefit of seeing your work! I love this pretty floral image, and you’ve colored it beautifully. I loved the sketch too! LOVE your layout. The gorgeous flower at the bottom with the hint of flower at the top is a great “frame” for the sentiment. Totally gorgeous!!! Love the way you colored the flowers!! Beautiful card Jen! Those flowers are gorgeous and your colouring is amazing! So glad you are able to take your colouring away with you! Thanks for a great sketch this week! Oh I really love this card! Your flowers are perfectly coloured – so soft and delicate! I love way you do these super-soft and super-sweet flowers. This is so pretty with that simple and clean sentiment.